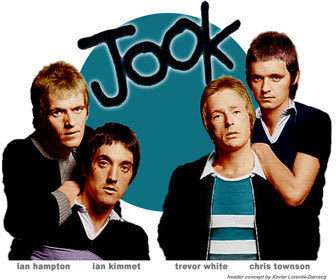 In 1978, British Chiswick Records label released Jook' "Rule O.K". Originally this four-song Ep had been released in 1976 in the USA on the "J-J" label owned by John Hewlett and Joseph Fleury (both were Sparks managers during the seventies). For a while, Trevor White led a band with guitarist Adrian Fisher (formerly with Sparks and later with Boxer), bassist Ian Hampton and Marc Mortimore, then Trevor joigned Martin Gordon's Radio Stars one year later. When Martin Gordon decided to leave to form "The Blue Meanies", Trevor White, singer Andy Ellison & guitarist Ian McLeod decided to continue under the name of Radio Stars until September 1979 but the magic was gone with the bass player. In 1981, Trevor White formed The Four Squares with John Hewlett, drummer Norman "Dinky "Diamond (formerly with Sparks) and Chuck Wagon who became member of L.A band The Dickies. Some demo tapes were recorded by the band but unfortunately nothing surfaced. Finally, Trevor White reunited with Martin Gordon in 2000 for the Jet "Nothing To Do Tour" performing his song "Crazy Kids" during the gigs. A live verson of "Crazy Kids" by Trevor White can be heard on the japanese pressing of Jet's "Music For Herd Of Herrings" Cd. 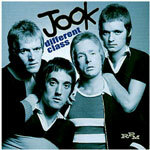 In 2005, an issue of the never released Jook album "Different Class" saw the light of day. This Cd contained all the singles and unreleased studio recordings by Jook. Today the UK market for 70's power pop has embraced the Jook, whilst elsewhere such as the States and Japan the market for proto punk has equally identified the Jook for re-appraisal. This collection has had the full input from the band members - Ian Kimmett, Trevor White, Chris Townson and Ian Hampton - including loan of archives and leader Ian Kimmett digging up his original album songwriter demos as a special bonus. The sleeve design was based on the bands look of the period as captured by photographer Gered Mankowitz, with name spray painted on a wall, spiky mod haircuts and accusatory stares at the camera. all of us. We inspired each other in our collective rebellion against all the boring traditional social mores and rock bands of the time. Our attitude was to capture the publics imagination a few years later with the advent of the whole punk movement. We pre-empted all of that." Trevor White : "Jook was labelled as skinheads in the press but we were Rudies... Skinhead was totally the wrong word. We wanted to be masculine, but not violent. We just wanted to have a good time. Jook wanted to cater for working class kids, not just on a visual level, but by giving them the music they really want to hear." Chris Townson : "Jook ? Probably the most fun I had in the music business, but ultimately the most disappointing... a real 'nearly' band. Ian Kimmet was without doubt the best "front man" I played behind. It's a great shame circumstance didn't give him the opportunity to 'sock it to 'em' on a bigger stage." Ian Hampton : "What missed Jook to have more success ? Well... bad marketing ! But we have recently all met up again. We still have some new musical projects and Jook may be about to reform..."
Trevor White : "Jook was the best thing we ever done, everything just as we wanted. Unfortunately we were desperate to have a hit. Our music was getting so contrived that at one point, we were listening to whatever was the number one single that week, to see what it had got, apart from success, that we hadn't. Then we'd borrow it. Integrity just went out of the window. We'd hear something and say, 'that's it, that's what we should be sounding like. ...If we'd stayed together we might have had the breakthrough."